The last time we talked about new cameras, Nikon and Canon had just introduced their least expensive models - the Canon Rebel XS and the Nikon D60. This time around, Canon and Nikon are introducing new "upper entry level" digital SLR cameras - The Nikon D5000 and the Canon Rebel T1i. The Nikon D5000 slots in between the entry level D60 and the D90 and splits the difference in features. 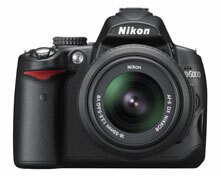 The D5000 matches the D90's 12.3 megapixel resolution and includes the same 720P HD video clip mode. 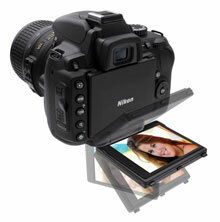 The D5000 also features an adjustable LCD screen that Nikon calls the "Vari-angle color LCD monitor". This is the first Nikon to feature an adjustable monitor and you can expect to see it on more models in the future. The screen is 2.7" in size and has 230,000 pixels of resolution. 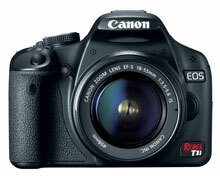 Canon newest Rebel series camera is called the T1i. The Rebel T1i gains the 15 megapixel resolution and the higher resolution screen from the Canon 50D while also adding in 1080P HD video clip capability (first seen in the 5D Mark II). The size and weight of the Rebel T1i is identical to the Rebel XSi. There is a chart that shows the upgrades to the Rebel line over time on our T1i page. This is an advance preview of our new R2 Dual Point Flash Bracket. Our original R1 Bracket was designed to allow the Nikon R1 macro flash to be better positioned near the end of the lens for intraoral views. As a side benefit, the flash heads could be positioned out to the side for better anterior esthetic photographs. The only downside was that flash position adjustments required you to set the camera down and use two hands. The (soon to be) R2 Bracket allows adjustments on the fly with only one hand. Bring the flashes in close to the lens for intraoral views or spread them out to the side. 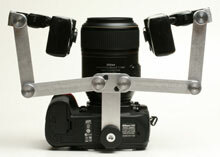 The pivot joints are designed for quick positioning and then hold the flashes where you want them. 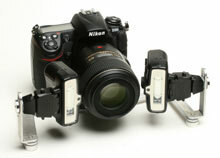 The bracket attaches to the camera tripod socket and does not cover the battery door or interfere with lens focusing. We hope to have the R2 Bracket available by August. If you would like to be contacted when it is available, send us an email (info@photomed.net) or call us at 800-998-7765. Recently, we introduced the Eye-Fi memory card that wirelessly transfers your images to your computer. The Eye-Fi "Home" card works with JPG images and must be used with a wi-fi router on your network. The new Eye-Fi Pro works with both JPG and RAW files and you can also use it in "ad-hoc" mode. This allows you to transfer images directly to a wi-fi equipped computer (most laptops) without the need for a wi-fi router. We should have the Eye-Fi Pro card in stock shortly. Eye-Fi also recently updated the software for all of their wi-fi cards to allow you to choose which images to transfer to your computer. They call this Selective Transfer and you can get more information here. After 74 years, Kodak's iconic color slide film has fallen victim to the shift to digital cameras. As of June 22nd, Kodak has ceased sales of Kodachrome.You can read the announcement here.